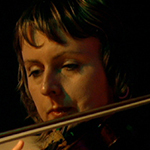 Calina De La Mare played violin with the Millennia Ensemble for The Divine Comedy. She toured with the band in 2004 and is to be found on Live At The Palladium. In 2005, she contributed to the recording of Victory For The Comic Muse. Calina has also played for many other artists including Anthony Reynolds’ Jack (The Jazz Age), Tindersticks, The Tears, The Magic Numbers, Berth Orton, Stairsailor, Sophia and James Blunt.